A first hand report on Dr. Michael Mann's embarrassing Disneyland episode | Watts Up With That? Elevated from a comment. Roger Sowell describes first hand what led up to Mann denying a TV interview about his work. Apparently, for Dr. Mann, Disneyland is not “the happiest place on earth”. Thanks, Anthony, for posting my small part in this rather interesting episode. I appreciate the link to my little blog, too! The Orange County Water Summit (at the Disneyland Grand Californian Hotel) was actually quite interesting, as water is also a favorite topic with me. There were a couple of other questions from skeptics, one related to Dr. Richard Lindzen of MIT. Mann replied that Lindzen is a maverick, and that the consensus is what we follow in science. He stated that we don’t believe in Evolution theory simply because Darwin proposed it, but because it has withstood the test of time and many scientists’ verification for more than 100 years (I think I have his answer pretty close to verbatim). David (Nazar) then decided he wanted to interview Dr. Mann first, then me second to get the skeptic view. He asked me to step away and return in 10 minutes. I went back to the presentation and took my seat. I could see Dr. Mann across the room, and he went out for a few minutes then returned. So, I went back out to find David and his camera-man. At that point, David told me that he did not interview Dr. Mann after all. He said, and I’m paraphrasing here, that Dr. Mann refused the interview and got angry. I believe David told him that he was to be interviewed first, then me, although I was not identified by name but by the question I asked. It could be that Dr. Mann did not want to be interviewed then have a skeptic follow him, with no opportunity to rebut. This is just speculation on my part, though. UPDATE: here’s a photo from Mr. Sowell at the event. Dr. Mann at the right under the “R”. Ha…. Mann finally admitted to a group that he is not a Nobel Prize winner… Wonder if my pushing his hosts at a conference a few weeks ago, and they corrected this in their promotions after some debate. I suspect Mann has a new sleazy approach – to have the hosts introduce him as a NP winner, then he can deny it and explain and show how honest he is. The other logical fault in the debate is…… If the science is indeed settled, then why do we need all these climate scientists? If it’s true, then (a) the models will be true and future measurement is unnecessary and (b) the scientists can be fired and the money spent on correction. And a big thanks to you Anthony for keeping the “kiss cam” on Dr. Mann. As alarmist scientists have explained, they have a choice between being an honest scientist and a dishonest advocate. Mann obviously has made many choices to be the dishonest advocate, but the worst has to be this polar bear ‘stuck’ on the ice floe schtick. That is simply indefensible for anyone even pretending to be a scientist. From one skeptic to another, I say “Excellent report, Roger.” You represented our position well, given the haphazard nature of your encounters. Mann’s attempts to deceive were amateurish at best. He and his fellow “consensus scientists” have grown accustomed to manipulating gullible, uninformed audiences who are receptive to the AGW fable. The charlatanism is always on full display; they don’t even try to disguise their lies and half-truths. I’m tired of this fallacy, and I’m tired of being labeled a creationist. By definition, the consensus must be wrong just prior to a new discovery like, say, the heliocentric model. Modern climate models resemble nothing so much as the ancient Greek’s (incorrect) epicycles. True science does not rely on polls, it relies on hypothesis, test, and evidence and can be falsified unlike the everything-can-be-explained-by CAGW meme. First you guess at it, then you compute its effects, then you compare those computations to observations. If the computations don’t match the observations, the theory is wrong. Last time I checked in everywhere but Mann’s world the models don’t match the observations. I can remember a time when people like me worried me. Now they just make me laugh. I wish some skeptics would not refer to the “most likely cause” being solar. There is as yet no mechanism. The solar influence is a wild-arse guess as much as CO2 is and does not improve the debate in the least. That’s because we’re living in the MMP (Medieval Mann Period) where any sufficiently advanced magic is indistinguishable from science. The problem is that they say they observations (with necessary corrections) match the models. They just don’t say which model at this time or why old data is adjusted down while new data is adjusted up. But they say it matches and they are the scientists and they have consensus. PG @ 8:44. Scafetta has newly proposed a mechanism for amplification of the planetary tidal effects. See Judy’s for an abstract. Over in the UK we are aware of Kiss Cam’s as David and Victoria Beckham appeared on one at a ball bouncing competition and it was all over the papers. What exactly does this episode mean? Here was Michael Mann, a leading icon of the alarmists’ AGW movement with access to the entirety of climate “science” that supports the consensus and all he brings to share are the same things any random nitwit peddles on the internet? Really? That’s it? And he can’t face a simple interview? With both the AGW hierarchy and their rank and file followers all left with no more than worthless models, cherry picked graphs, a polar bear pic, foolish attributions and confusing contradictions perhaps leading skeptics should consider some sort of uniform declaration of success. It may not get any better if Mann et al cling to their silliness in perpetuity so perhaps an abject dismissal of the alarmists’ foolish campaign may prove to be the best way forward. adequately brand it for what it is? I mean if his Majesty Michael Mann is in effect presenting himself as no more than a pompous imbecile shouldn’t the response be mostly reintegrative shaming vs attempted debate? I would especially like to see our most elder skeptics enjoy victory before moving on to the hereafter. So can we pick up the pace a bit to help them out? …The more things change the more they stay the same. Here is a map of Iceland from 1587, notice the little polar bears on the broken up ice in north east Iceland, some of them are really struggling to get on the ice. Over four hundred years ago. Oh the humanity! So proud of the way you try to keep people accountable before the masses and the rest of us informed. Who knew all the those years ago life would turn out to be so interesting and you would be right there in the middle of it. Thanks! I find it amusing that Mann responds to skepticism re CAGW with the platitude there is a ‘consensus’. Definition: 1. broad unanimity: general or widespread agreement among all the members of a group. If there were consensus, there would be no skepticism. Disneyland was clearly the appropriate forum for the interview. Mann’s days as a rent seeker must surely be numbered. You can’t fool all of the people all of the time. Can anyone justify displaying a Arctic ice graph that stops at 2007? That’s missing the latest 5 years of data, or roughly 15% of the total data since 1979? It can’t be lack of time, I’ve downloaded the ice data and plotted a graph in a few minutes. IMHO, it seems to be strong evidence of manipulating the message, doesn’t seem like science anymore. Thanks, Suzanne! I’m just trying hard to keep up with the rest of y’all from our teen years and college days! This report is fantastic. Thank you for making my Saturday (even if I am at the office). I cannot wait to see all of Mann’s UVA emails when they get released. They will be a treasure trove, I am sure. Roger did you steer the media to this site and others like it? Yes, before the camera rolled, David Nazar and I talked a bit and I told him that Watts Up With That.com is an excellent source of climate science information. Who knows if he wrote it down or remembered it later. He seemed more concerned that I had no organization behind me. An army of independent skeptics seems a novel concept. I am astounded at the lack of knowledge on east coast hurricanes by these people. Ever hear of Connie and Diane (1955) Gloria. 1938 in New England, AGNES IN DR MANNS BACK YARD. OR ELOISE. What gives with you folks. You should know the atlantic is in the warm AMO. If anything Irene UNDERACHIEVED but just what do you think is going to happen when you have a 955 mb hurricane running the east coast. IF you folks on the AGW side don’t know, then please please I beg of you, study the history of these storms. How the McKibbens, Cullens, and now this, Phds, make these statements like you do means you can not have looked. It has to be that simple. Have you ever researched what happened on the east coast with hurricanes in the last warm AMO? So What would you say if you had 2 billion trees knocked down in a hurricane in New England now like 1938 with a wind gust to 186 at Blue Hill and 13 feet of water into Providence, Carol almost doing the same in 1954, with Edna 10 days later on Cape Cod. Or a Donna that gave hurricane force winds to every state on the east coast like 1960. Or 1944 with anemometers blowing away on the Jersey shore as a 20 foot storm surge took out boardwalks, from a storm that had a sustained wind of 134 with a gust to 156 OUT OF THE THE NORTH at Cape Henry. What would these merchants of fear do if we had 1954 again? Carol, Edna, Hazel, with 1955 and the floods of Connie and Diane. 5 disasters. 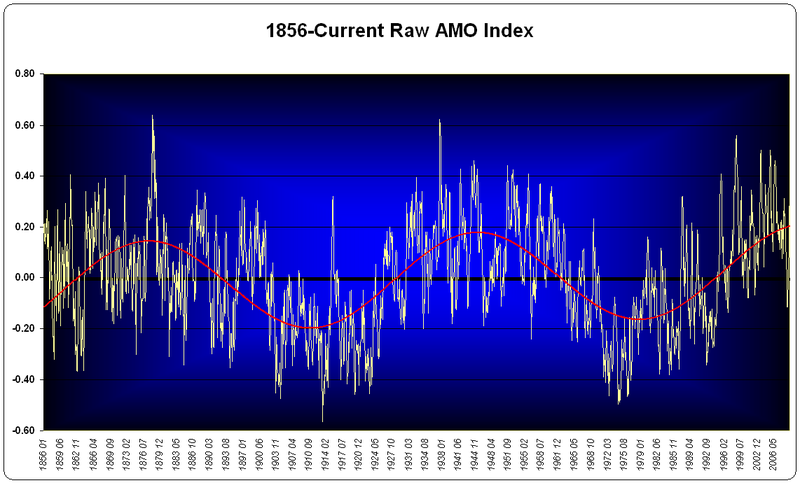 All of equal or greater magnitude than Irene in 2 years AND GUESS WHAT.. DURING THE WARM AMO! My belief is this cycle has vastly underachieved on the east coast with the hurricanes!!! Look what happened in 1971 to NJ IN TROPICAL STORM DORIA for goodness sakes, in a cold amo as were AGNES AND ELOISE, major floods. I can name a dozen storms but it bores readers here that actually have researched these things. I can’t decide what is worse.. either you actually don’t bother looking and make statements like the nonsense we hear about Irene, or you know the history and simply ignore it, or worse, are being deceptive about it. And while we are it, with the arctic sea ice. 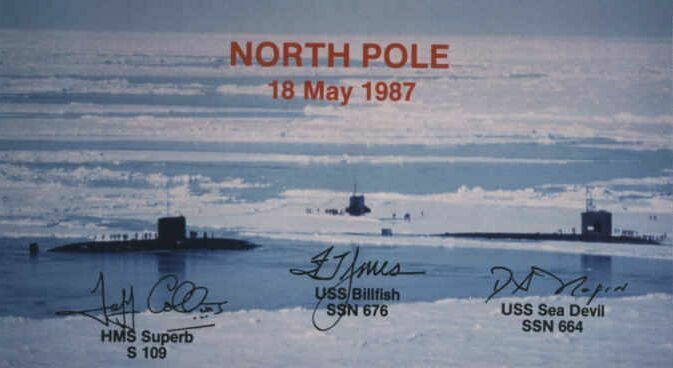 Yesterday was the 25th anniversary of THREE submarines submerging in LARGELY OPEN WATER AT THE NORTH POLE. Another deception being pushed down peoples throats. TWENTY FIVE YEARS AGO YESTERDAY! Its one twisted fact after another. Hurricanes, actual global ice, actual winter this year in northern hemisphere. PDO denial. I would love to get all these people in a test and actually ask them to show what they know about the storms and weather events of the past. To them its like it never occurred. Again supporting my theory on this being a massive case of Dunning Krueger effect; confidence because of ignorance of anything that can challenge your position. Any ideas for new Disneyland rides? Pirates of the Climate. Dr. Mann’s Wild Ride. 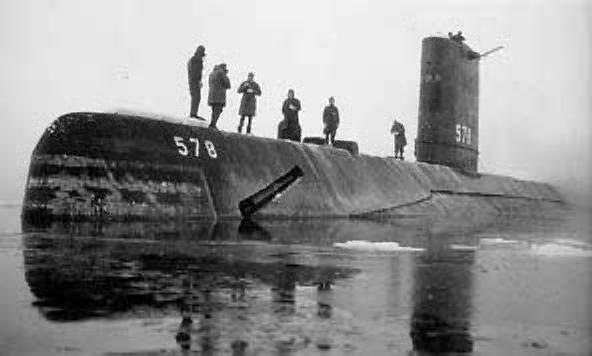 Yamal, Yamal, Yamal Room. It’s a Warming World? Phil Jones: “The internet has allowed all these people to find one another unfortunately. ” [FOIA email #2621]. There we have it. Straight from the horse’s mouth. He also uses “the D word” in emails #2274 and #0856 to say the same thing. That Dr Jones should choose to express himself that way appears to be evidence that we are in fact not party to some well-funded conspiracy by ‘big oil’. “My question is for Dr. Mann. Dr Mann, in your 1998 paper co-authored with Dr. Briffa [should be Bradley] and Dr. Hughes, you showed a warming since 1960. The same hockey-stick graph was shown earlier today. However, you chose to not use tree core data after 1960 but instead to splice on the instrumental temperature record to in effect “hide the decline” of the trees after 1960. While the MBH98/99 HS has lots of problems, it in fact runs up to 1980. The truncation at 1960 pertains to Briffa’s MXD (maximum density) series, which was not used in the HS, and so is irrelevant to Mann’s HS itself. MBH98-99 apparently did substitute instrumental data after 1980 to compute its smoothed version of the HS up to 1980 (“Mike’s Nature Trick”), but in the MBH papers the effect of that was fairly subtle. It was Jones’ later use of the same trick in the WMO graph that gave a completely misleading impression. So in fact Mann was correct to say that your question contained false information, since you were accusing him of someone else’s deception rather than his own. The one statement that jumped out at me was the one about science being about consensus. Plate techtonics and continental drift is the subject that is usually cited in this argument but there is also the one about bats. The biologist that worked out that bats use ultrasound to hunt and find their way around started out as a minority of one. The consensus was that he was mistaken. Our sun provides 98+% of the energy that heats our world. Without it, our planet would begin to freeze in about 9 minutes. Temperatures would drop very quickly. Since our sun demonstrates various cycles: 11, 22, 100, 1,000 etc, and our climate varies in similar (though not exactly the same) cycles’, it is highly probable that our sun is the root cause (along with the Earth’s orbital dynamics) of 90+% of our climate. Many recent peer reviewed papers are demonstrating these cause-effect relationships over 100’s & 1,000’s of years. Sure is a much higher probability than CO2 concentrations. I’m not forgetting about the complex nature of our climate. Thermal and fluid dynamics of the oceans and atmosphere introduce perturbations, natural cycles and time lags into Earth’s response to solar variability. Mann is a fool. Why? Because he believes in his research. Research is not to be “believed” in. He should save it for the pew. But because Mann’s faith rests in his research, debating Mann is like arguing with a fool. Casting pearls before swine certainly is a loftier endeavor. I would be thankful that he refused to talk. Bill, your comment is without substance and your review of said research was not done with a very critical eye. The mechanism behind CO2 forms a much stronger case than the empty shell of solar/temperature wriggle matching. However, AGWers fail to nullify intrinsic natural variability. Both sides of the CO2/solar debate make separate but equally major failures. And of course the Sun heats the planet directly. Whenever solar enthusiasts start their agrument with that tired verse, I cringe. I was there during Hazel. Big blow lots of rain. Living on Topsail Island on the N.C Coast. Dad got his release from active duty 2 weeks early. We got out just ahead of the biggest blow and did not go back. Amen, brother, Amen. I lived on that coast for a long time and I remember living Cape Cod in the 70s when old timers were still talking about the one in “38 forty years later. 1. There is no consensus. 2. There is a conspiracy to create the perception of a consensus. “150 years of warming” ? NOT. The warmists themselves seem to now be claiming that AGW actually only began to rear its head since the 1970s. (That would seem to indicate that the first 50 to 100 ppmv increase in co2 had no effect on temperature.) Of course, from the 40s to the 70s was a known cooling period. Then there was global warming from about 1975 to 1998, but since 1998 there’s been a flat global temperature – as co2 continues its steady increase. Clearly none of the models (except perhaps those recently “tweaked”) have projected such an outcome. (and given the distinction between the terms “projection” and “prediction”, what’s that worth?) In any event we’re not talking about much evidence of warming, let alone whether it’s anthropogenic. The warmist claims of minor impact of the MWP and the LIA, and when the current warming began have been thoroughly debunked, and that seems obvious even without taking into consideration at least one earlier email claim that they had to “get rid” of the MWP. Pamela Gray is correct with her advice to skeptics to avoid choosing a “most probably cause”. Having to pick a most probably cause a trap. It diverts the focus from the weaknesses in the GW argument to potential weaknesses in yours. that the instrument record is reliable and not contaminated by UHI and analysis adjustments. that warming will not instead be a good thing or at least neutral. that government actions CAN stop it all, much less should. that government actions to control CO2 will not be a cure being than the disease. The burden of proof is not on the skeptic. It never is. It is the IPCC and those who wish to obtain the power and money to control CO2 who have the burden to make their case. They are the ones who must prove the strength of their chain of weak links. A skeptic must only point out the flaws in one or more of the links. Now it helps if the skeptic is armed with several alternatives explanations to the alleged observations. Adjustments to the temperature record stinks like a smoke-filled room. UHI component of the temperature record is still underestimated. Other causes of some of the Warming could be changes in Solar energy , Cosmic Ray Flux dependent cloud formation, Ocean Cycles, even our own Clean Air Regulations in addition to increases in CO2. Geology shows us that the world has been warmer and cooler in the past without catastrophe. Typically it’s been a lot warmer than today. If history is any judge, I would prefer the climate to be two degrees warmer than two degrees colder. If warmer, we’ll adjust. If colder, crops fail and we go hungry. Compare death rates as a function of the outside temperature. Stop and evaluate the anticipated results of proposed government actions and regulations to control CO2 and see how utterly impotent they are to controlling the problem as they state it. Well argued, Joe. Thank you very much for really putting Mann in his place on that issue. I notice that Mann’s anger in this incident seems to stem from the fact that Mann’s arguments have become so indefensible that even the People’s Bolshevik System is no longer willing to extend the customary kid-glove treatment to his side of the debate. Dear oh dear Pamela… you cannot show a tight correlation of planetary temperature and CO2 concentration over time, except in extreme values of CO2. To add to that, it IS proven that most of that CO2 during warm times has been belched up from the oceans some 800 years AFTER the heating as the warmer fuid can hold less dissolved gas. During the glacial periods the cold oceans absorb large amounts of CO2 to be upchucked later when the climate has warmed. There IS tight correlation of a combination of the ENSO, the ADO, and other major oceanic cycles coupled with solar cycles. If your argument is that the sun does NOT do it all, then we agree. But if you are trying to toss out solar variability as moot, then we are at odds with the data – the unmolested data. The argument against global warming mitigation should be that it’s a dangerous gamble. If the effect of CO2 does turn out to be minor, and temperature changes are cyclical or unpredictable, global temperatures could cool even as CO2 increases, just as we’ve bet everything on warming. The result could be economic depression or even massive starvation. How confident are you about the “consensus”, mr. journalist? Mann is an anti-Nero. He fiddles the figures while the planet potentially freezes. In regards to Mann not being interviewed and past reporting (cough) on AGW… The hypocriticalness of media on AGW is damming of them. The media continues to ask probing and grilling questions of AGW skeptics (the media declared non-experts and non-scientists); while continuing to give the AGW promoters (supposed experts and scientists) soft ball questions and soap boxes to pitch AGW from. This is coupled with media’s ongoing proclamations in the expertise and knowledge of proponents of AGW, and media’s decrees of science and fact backing AGW as being real. With the media’s stance in reporting on AGW, would it not stand to reason that proponents of AGW (Mann, Jones, Gore, Hansen, et.al); be the most capable in the Co2 / climate debate of defending their position? Shouldn’t the media be asking them the hard ball questions? Shouldn’t the “fair playing” media being going easiest on those supposedly least capable of defending themselves (aka the skeptics)? The fact the media continues giving proponents of AGW EZ questions from lofted platforms; shows the media is colluding with AGW promoters to perpetuate a scam. The media knows AGW is B.S. AGW has nothing to do with science, facts, climate change, or supposed man induced warming. AGW is politics on a global scale. AGW is about redistribution of power, control, and wealth throughout the world. Do we actually need a proven, causal mechanism before it is prudent to act? We can look to the ancient past, when humans had no clue why the sun rose in the East and set in the West. They had no clue why it became cold each winter, but was warm enough to grow crops each summer. They (we believe, at least I believe) figured out the correlation, though. Warm summer equals “plant the crops, and food will grow.” Would it sound silly, to be in a village council meeting thousands of years ago, and argue that we should not plant crops in the Spring because there was no causal mechanism to guarantee the warm summer would follow? In my recent speech to the chemical engineers in Southern California, I made the point that we have excellent correlations over hundreds of years that show weak sunspot cycles produce global cooling. In fact (I did not emphasize this, though), we have evidence that very weak or non-existent sunspot cycles produce extreme cold. The opposite is also true: strong sunspot cycles produce warming, while modest sunspot cycles produce and intermediate temperature.. It is apparent, at least to me, that the late 20th century warming could be attributed to the combined warm ocean cycles with strong sunspot cycles – with no need for CO2 to be considered. The engineers in my audience, a very skeptical bunch, tried to refute the line of evidence before them. This is what engineers do (not limited to engineers, however, as many others also do this.) I also have tried my best to refute this. I stated in my speech that I could be wrong, and indeed, I hope I am wrong. Catastrophic global cooling is not something to take lightly. But, the fact remains that, once again, we have a cold Pacific Ocean, and a weak sunspot cycle at this time. 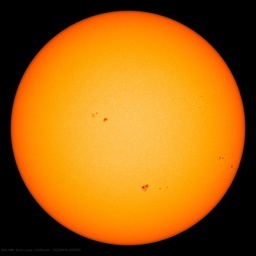 Experts are saying that this sunspot cycle will be the weakest in many decades. That is an appeal to authority, I realize. However, as a good skeptic, I checked their claim and found it to be true. If, as predicted, the current sunspot cycle peaks at approximately 60, that will indeed make it the weakest since approximately 1800. (see figures 20 and 21 at http://sowellslawblog.blogspot.com/2012/05/warmists-are-wrong-cooling-is-coming.html). Therefore, we have (as I presently see it), a cooling globe, a cold Pacific Ocean, a weaker than normal sunspot cycle, yet CO2 continues to increase by approximately 2 or 3 percent each year. Something, clearly, has stopped the warming, and started the cooling. Very few things can account for this: perhaps the CO2 has disappeared? No. Perhaps large volcanoes have erupted, placing reflecting aerosols in the atmosphere? No, we would have noticed this. Perhaps the sun’s total irradiance has decreased dramatically? No, we have ways to measure this and that did not happen. Perhaps all or most of the polar ice melted, which cooled the oceans, and that cooled the land? No, we certainly would have noticed this also. Have the polar ice, or land-based glaciers, grown dramatically so that more of the sun’s energy is reflected away? No, although that would cause a cooling. Is there too much soot from coal-burning, or other industrial air pollutants that also increase albedo? Possibly, although that seems remote. Then, what is left? What can explain the inflection point in the global temperature curve from approximately 2000 until now? I maintain that now is an excellent time to re-frame the debate, and focus our considerable abilities and energies (as a whole) to answering that question. If it indeed turns out that a weak sunspot cycle and simultaneous cold ocean cycle produces catastrophic cold, we are going to look rather silly in about 10 or 20 years time. Our children, when grown, will figure this out and ask, Why didn’t the scientists make the connection between sunspot cycles and cold? They had ample evidence from the past. Why didn’t someone sound the alarm, and take prudent steps to try to prepare for the bitter and prolonged cold? Forgive me in advance for gratuitous speculation. I’m not so sure Mann believes in his research anymore. He’s no fool. He’s been exposed for mathematical malpractice and surely he must understand why. It’s not necessary for him to believe in his research to continue on the warmist path (warpath? ), which is obviously lucrative (no more “grant-grubbing”). It’s more lucrative than the alternative, which is to admit he’s wrong and that they simply don’t have a clue as to what the climate will be like in 50 or 100 years. He’s a figurehead, a movement celebrity. That provides income and notoriety, which is apparently what he’s been after since the beginning. I’m guessing he’s a lukewarmer now but knows that the extent to which mankind is driving the warming can’t be quantified with any degree of certainty. It’s like the conspiracy theorist who writes a book with all assuredness that his theory is absolutely true or at minimum plausible and that his book proves it. Even when alternative theories containing persuasive contradictory evidence appear, he feels compelled to defend his original position because now you have CONTROVERSY and opposing points of view, which attracts news media attention. Then you get to write a second book knocking your critics and providing new and/or updated information. Or a better analogy might be the pastor whose faith is succumbing to agnosticism yet who continues to preach and tend to his congregation. Consensus is the opinion approved by most scientists before a few of the brightest ones force them to accept a truer one. I tried to copy/paste comments but my PC is acting goofy ( perhaps because this post is about DisneyLand and Mann? ). RE Pamela Grey & Roger Sowell’s exchange: Mann and the “Team” are the ones claiming that 2+2=8. We don’t have to “prove” anything. We just have to keep pushing that THEY prove where the “8” came from. @Roger Sowell: Do we actually need a proven, causal mechanism before it is prudent to act? 2b. whether the act contemplated is favorably aligned with each 2a. The case for the existance for sources of bias is a fine argument against the use of Post-Normal Science. … Yet the thesis that bias is persuasive in today’s science seems to me to strongly argue that we need to double-down on Normal Science to first eliminate potential for bias. I once heard Mann take a question of, if future warming would bring more La Nina-like events, as they did in the past, then doesn’t that mean models vastly overstate warming. To my surprise, Mann replied that he agreed with that, and he thinks there is a missing negative feedback. Note that this comes from the existence of a hockey stick, which Mann says was limited in area, because the tropics exhibited LaNina like response to the warming. The reason Mann achieved infamy which led to him being a prominent guest speaker at events such as this was that his 1998 paleo reconstruction of temperature obliterated the previously held climate consensus of the little ice age and medieval warm periods. Mann’s rocketing career launched as a result of him being a science ‘maverick’ in many ways, all of them misleading, wrong, or displaying gross incompetence. He has had a stunning impact on paleo-climatology, almost single-handedly destroying its credibility in a little over a decade. Quite a feat. very good work Roger and perhaps there is some hope that reason will prevail over fear! Thanks Roger, it’s always good to read a point of view (and account of the ongoings) that hasn’t been done over by the Establishment. What a coincidence. I saw the same Mann talk at the Univ.of Connecticut recently. I asked him one final question before he abrubtly left. ” What do you have to say about the recent study by Zunli Lu, et. al. as well as others that support the fact that the Medieval Warm Period and Little Ice Age weren’t just some local phenomena, but were more widespread” . Mann sloughed it off by saying that he had contacted the author and he had renounced his findings. I find that hard to believe since it was a peer reviewed paper by a group of authors. (below). Just the fact that each event lasted more than a hundred years should mean that they could hardly be localized. Calcium carbonate can crystallize in a hydrated form as ikaite at low temperatures. The hydration water in ikaite grown in laboratory experiments records the δ18O of ambient water, a feature potentially useful for reconstructing δ18O of local seawater. We report the first downcore δ18O record of natural ikaite hydration waters and crystals collected from the Antarctic Peninsula (AP), a region sensitive to climate fluctuations. We are able to establish the zone of ikaite formation within shallow sediments, based on porewater chemical and isotopic data. Having constrained the depth of ikaite formation and δ18O of ikaite crystals and hydration waters, we are able to infer local changes in fjord δ18O versus time during the late Holocene. 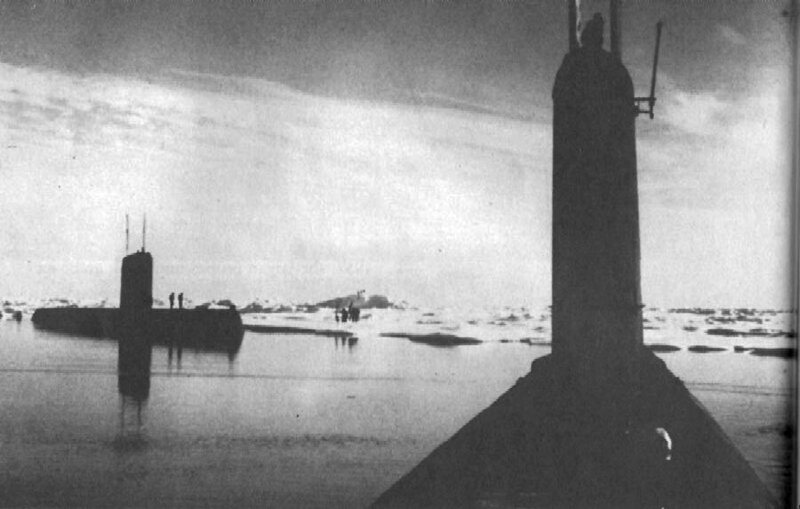 This ikaite record qualitatively supports that both the Medieval Warm Period and Little Ice Age extended to the Antarctic Peninsula. Mann replied that Lindzen is a maverick, and that the consensus is what we follow in science. Prior to 1962 the consensus view was that the ocean basins were stable features, and people believing in continental drift were elements of a lunatic fringe. After 1963, if a person did not believe in continental drift they were considered part of the lunatic fringe. I suppose that Mann views consensus as simply changing very quickly…but never, never the result of a Maverick or two. The two paragraphs of the question Roger Sowell posed for Dr. Mann are contradictory to me. Either Mann’s tree ring data showed a “decline” after 1960 or the tree ring data was “cherry picked” to show an upward hockey stick shape. How can both be true? If he had tree ring data, cherry picked or otherwise, that showed a hockey stick shape when graphed, why would he need to “hide the decline”? It doesn’t make any sense to me. I mean, either Dr. Mann produced his famous hockey stick graph using “the instrumental temperature record” because the tree ring data showed a decline after 1960, or he “cherry picked” tree ring data to produce an ascending hockey stick. Which was it? Or did he do both at different times and I’m getting them confused as one event? Can anyone explain this? People have the greatest respect for engineers. Ya know, the guys design neat stuff like giant plasma TV’s, hot cars, killer stereo systems, cell and smart phones, CD and DVD players, blazing computers and tablet computer and so forth. Roger, thank you a very well written post and for your sincere contribution with regards to “the cause”. An army of ones? Quite a novel concept indeed with regards to ‘climate change’. Not an independent army but an army of independents, researching, asking questions, voting, searching for the truth, etc. The truth in the hands of an army of independents is a powerful concept. Thank goodness he wasn’t placed under R2. That would’ve been a foolish and incorrect thing to do. Technically, a law degree is a Juris Doctor, but I can’t think of any attorney who claims to be a doctor. I have never done so. I didn’t say my name or that I’m an attorney and engineer at the Q&A microphone, since that was the protocol at this meeting. None of the questioners did. Many other meetings or panels do require the questioners to identify themselves for the record. However, the name-tag they issued me at the Water Summit identified me as an attorney but not an engineer. Everyone I met could read that. Almost everyone asks what type of law I practice, and I tell them with a brief statement of my background in engineering. But, the reporter, Mr. David Nazar, asked me these things so I told him. Mann is a pure bureaucrat. He is funded and rewarded by the State, receives accolades and awards from the State, and the State is the only customer for his ‘product’ (technically known as a monopsony). In return for this nurturing, Mann gives the State a ‘product’ that it can use to further its own ends — global warming alarmism. Everyone inside this arrangement benefits — the casualties are 1) truth 2) taxpayers. Excellent analysis. Mann lies for money and status, because that is what his employer demands. True, but he hasn’t yet run out of money with which to fool some more of the people. Mann, like Pharoph Rameses did, has called with his own lips the future responses to any claims of AGW. I can understand why people are concerned about the decline in temperature shown in the tree ring record after the 1960’s but before that time tree ring data correlated with other proxy’s and even the instrumental record very well. Like Mann said, there needs to be more research done on the effects of increased CO2 and pollution on tree rings since 1960. Are you all suggesting that tree ring data should never be used as a proxy record before 1960? Mann even took your criticism and developed a proxy temperature record that does not include tree rings (http://www.ncdc.noaa.gov/paleo/pubs/mann2008/mann2008.html). But even though Mann did that, it still needs to be said that tree ring proxy’s correlate with other proxy’s very well, and just because there is a serous anthropogenic process going on at present, which is most likely causing the tree ring proxy divergence after 1960, does not warrant the removal of all proxy tree ring data from temperature reconstructions before 1960. All following the concept of scientific method. I was once told recently in a debate with an alarmist that electricity, computers etc, were examples of “scientific method”. I kid you not. If you’re using the AGW KT97 and ilk cartoon energy budget then what do you know about the Sun? Nought. It’s missing the direct heat from the Sun which actually heats up the Earth’s land and oceans, and you warmers haven’t even noticed.. “Shortwave in longwave out” is what makes me cringe. Is Mann merely mislead? Or is he dissimulating or dishonest? I think this – together with another account for the East, as well a a prize winning Dutch science article in Natuurwetenschap (if memory serves me – it is still linked to in English at Ross MicKitrick’s web site) from 2004 or ‘5 – tells us, if we read the evidence of our own eyes clearly. THIS IS WHAT’S TRULY DISTURBING: how does an evident prostitute gain so much power, respect, and professional influence. The needs to be a popular, American version of “The Hockey Stick Illusion,” methinks. Shakespeare (almost), Measure for Measure. Really, Dr. Mann? Because what I thought…what I HOPED to be true…is that in science, we follow…the science. If what you say is true, then science deserves to be looked at with suspicion, because there is no more compelling evidence than that statement that what we call science now is disconnected from what we think science is. I am so tired of this consensus thing. Consensus is not an element of the scientific method. I challenge anyone to show any textbook that says that science seeks consensus as validation of theory, or, even more importantly, that consensus is part of the scientific method. Consensus is NOT a a scientific methodology; it is a political one. Consensus is what you do when you want to move forward, but there is not unanimity. In fact, consensus, by definition, means that there are opposing views. Science history has demonstrated over and over again that consensus is NOT a good tool for determining the true way that our universe works. Or, to put it another way…anyone who relies on a “consensus” is not a scientist…but a politician. Not a truthseeker, but a facilitator. Not a person whose word means truth…but a person whose word represents the seeking of money and power. Truly…his arctic ice graphs stopped in 2007? Is there any truer indication that conveying reality is not his goal? I like your answer to David Nazar because he should have asked Michael Mann why he is so angry and rude, not you. However, I think I know why—and I assume you do, too. It’s easy to guess because AGW proponents brought up repeatedly how angry they are with the media for giving credibility to skeptics by juxtaposing their views with those of “legitimate scientists”. It became their mantra lately when asked about losing the public. It must be infuriating to them that PBS would do it, too. They are supposed to own PBS. 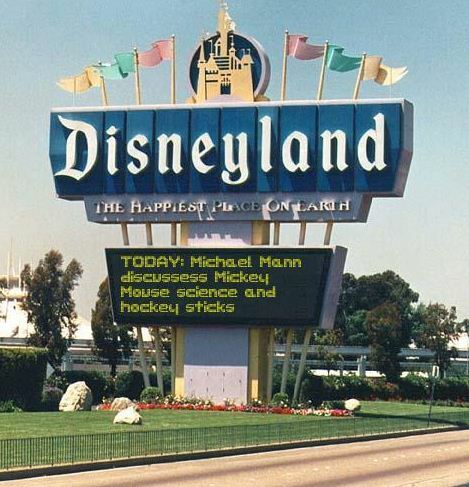 Well Disneyland is about the right place for Mann to do a presentation since his science is based on some Disney film not real data. Hey, is there anyone out there who truly believes Mann is a sincere, honorable and honest scientist? There must be someone somewhere. Step 1: Define who is a climate scientist by allowing only those in agreement with current AGW doctrine to label themselves as a climate scientist (since climate science is not an established academic discipline in itself). Step 2: Control all scientific publication in the area of climate science, since the peers of peer review will simply be the members of the climate scientist population you’ve already defined. Step 3: Claim a consensus among the climate scientist population (easy to do, since you’ve already defined that population). Step 4: Dismiss any dissenters as not being recognized climate scientists. Step 5: If any climate scientists break rank and depart from the current orthodoxy, label them as a maverick, or as being funded by big oil, or as being past their prime in the field. Best laugh of the week! I cringe too, Pamela. Our resident solar expert has spent a career looking for such a link & hasn’t found it. I don’t know why it’s so hard to imagine that large climate changes are internally-generated by regional solar input changes — which aren’t caused by intrinsic solar changes, but by earth’s orbital variations & ocean/atmospheric shifts — like the D/O & Heinrich events. Is the “R” for round? I wish some skeptics would not refer to the “most likely cause” being solar. There is as yet no mechanism…..
Pamela, you forgot the Gerard Roe’s 2006 paper “In defense of Milankovitch” Luboš Motl has a good summary and pointers to the paper. Milankovitch cycles are all about the change of solar energy as seen from earth. Given even the Climate Collaborators acknowledge the Milankovitch cycles, I think we can also acknowledge them. What causes the finer adjustments in the climate? We really do not know but we do know that the water cycle, ice, ocean and clouds have a major effect. How or if the variation in the sun effects the water cycle is still in the “discussion” phase. But you are correct we are still in the search for all the confounding factors that effect the climate so no one can really make any statements without the specter of eating crow pie later. Michael Mann, lead author of the paper that introduced the hockey stick graph to the global warming debate (featured in the 2001 UN report on climate change) talks about his experiences being the subject of attacks by those who disagree with his conclusions. He spoke at the Penn State Bookstore in Happy Valley, Pennsylvania. I hope someone sees this in time to make a recording, for posted to youtube. There are so few people in the audience for Mann’s book review, they has the appearance of being hand picked. I wonder if some one might recognize, put names to the faces. Regarding the above discussion on solar impacts versus other impacts on the climate: I’m not a solar expert. I do look at numerous solar graphs and other data, such as this one from Dr. Leif Svalgaard, a recognized solar scientist. The graph shows the sun’s magnetic field is clearly weaker now compared to the previous 45 years, noting that the data begins in 1966 or 67. If, and I repeat IF, Dr. Svensmark’s proposed mechanism for sunspots and cooling is correct, then the weaker solar magnetic field will produce more clouds and thus a global cooling. As I stated in my speech to the chemical engineers in April, we have a ways to go until we know. Most likely, by summer of 2014. Of course, if Dr. K. Abdussamatov is correct, that will be too late. Crops will be failing around the world, and we have not nearly enough food supplies stored to meet the demand. I will be happy to be wrong on this one. Very happy. Fixing** it for ya ~ but before that time Mannipulated tree ring data semi correlated with some cherry picked proxy’s and even the biased instrumental records, well sort of. ** No climate work coming from Mann can be taken at face value as being accurate or factual do to Mann’s Hockey Schtick. That speech was a lot of fun, and it was rewarding to have a few college students from California State – Long Beach in attendance. They seemed to not be aware of any of the points I made, and it came as somewhat of a surprise to them. This is how it is done, the key to propaganda (lying) and not getting caught is not what you say, but what you do not say, and what you assure no one else is allowed to say. He did not decline the interview because of any litagation, but because first, he might be asked some uncomfortable questions and be caught on camera trying to answer them, and because he does not wish under any circumstances to allow a skeptic to comment or even talk about any of what he says as that would violate the rule above, which is to assure that only his side is presented. In his case, do not ascribe to incompetence what is adequately explained by malice. At least we agree that CO2 is a wild-arse guess. As to solar, take away the Sun and you got Uranus and Neptune’s Icy cold climates. Bring Sun back, albeit to closely, and you got Mercury and Venus’s Firey hot climates. Thus, it would seem solar influence is more than a wild-arse guess. Piers Corbyn of Weather Action is making a profitable living predicting the weather up to a year in advance from correlations with solar activity. Whereas, Global Warmers have failed with their predictions and to even accurately tie climate to CO2. Thus, it would seem solar influence would be a better guess than CO2. It seems that Mann is now getting the treatment at public events that have plagued Gore (I recall his book signing event where he was “intruded upon” by a guy with a microphone, also the event where he got frustrated with skeptical questions and was heard swearing into a mike that he thought was turned off. Haven’t heard much of Gore recently. … If, and I repeat IF, Dr. Svensmark’s proposed mechanism for sunspots and cooling is correct, then the weaker solar magnetic field will produce more clouds and thus a global cooling. As I stated in my speech to the chemical engineers in April, we have a ways to go until we know. Most likely, by summer of 2014. You and me both. But just in case I moved south and bought a farm. I am now switching to long haired sheep and goats. I am also building a green house. Mid North Carolina is still looking at a May with a max temp of 91F for one day with the rest in the seventies and only ten days above eighty (five of those being from the current forecast). Compare that to May of 2004, two years after peak of cycle 23 when the solar influence should be at the maximum. There were 17 days of max temperatures above ninety and two days of temperatures of 98F. The local weather points to cooling. It’s all about the variability of overall solar input, not the obvious fact that the sun heats the earth (duh). The solar “cycles” are cycles of magnetic activity. How does magnetic activity affect weather, which is a water-vapor-driven heat engine? The slight TSI variability is well documented, and it cycles back & forth, so no net affect over ~11 yrs. Even if the sun went to a minimum Maunder state, the temp effect would be ~.1C. @Roger Sowell 7:13 am Of course, if Dr. K. Abdussamatov is correct, that will be too late. Crops will be failing around the world, and we have not nearly enough food supplies stored to meet the demand. Ah. If the act you contemplate (re Rasey 2:32) is to take a lesson from Joseph and store grain for future lean years, then that act would seem prudent regardless of the direction climate changes in the next decade. Repealing mandated amounts of grain ethanol to be blended with gasoline would seem to be prudent for the same reason. … does not warrant the removal of all proxy tree ring data from temperature reconstructions before 1960. The problem is selective removal of proxy tree ring data, both before and after 1960. Any statistician worth their paycheck can tell you why this is not valid mathematically. Dendro-Thermology is built on the premise that you can improve the accuracy of trees as a predictive tool by excluding those trees that do not correlate well with modern global temperature averages. Using that same argument, we could then eliminate all but 1 tree. Find the one tree in the world that best matches the global average temperature over the past 100 years and use that tree as a proxy for the past 1000 years. For example: Let us construct a similar model say using US GDP over the past 100 years. We know that if we add up the GDP for all 50 states it will correlate perfectly with US GDP. Now just look at the past 10 years, and select only those states that for the past 10 years have matched the US GDP. Dendro-Thermology would have us believe that using only those that matched for the past 10 years states, we could get a better prediction of past GDP for 100 years than if we use all 50 states. However, that is wrong. Just because an individual state has matched the average over the past 10 years doesn’t mean it will match the average over the past 100 years, even though there is a cause and effect relationship between national and state GDP. This is the fallacy of selecting only trees that match the present and using them to predict the past. It doesn’t work mathematically. It sounds logical, but it is nonsense. It may be argued that you are eliminating noise, but you aren’t. You are eliminating information, leading to a false positive. You statistically over-estimate the confidence in your result. Yes, I make this point in my speech. We have so little food grains stored that just one crop failure globally will result in massive starvation. We also have no time (as Joseph did) to grow extra crops and store them. We presently pay farmers not to grow crops. How stupid will that policy look in a few years? My grandmother understood and preached us to enjoy warm weather, but always be prepared for cold weather. She kept a store of discarded tires to act as heat sources for tomato plants. She kept a store of cold spring variety and warm spring variety seeds. She built window sized glassed movable boxes (made out of discarded windows and old barn lumber) to act as impromtu greenhouses. The veggies she grew varied depending on the onset and conditions of the spring she was experiencing. Top layer soil temperature compared to shovel depth soil temperature was one of her measures, as was the appearance, number, and condition of night crawlers. She had a ready made system of germinating seeds indoors when temperatures were too cold to plant directly into the soil. By pre-germinating seeds, she could still have warm-weather plants when spring temps was too cold to germinate those seeds in soil. The wisdom she had regarding working with growing conditions made me believe she could grow lettuce at the North Pole. For example, looking at US data, I see that the states of LA, VA and SC exactly matched average US GDP last year at 2.6% change. Using the “climate science” logic of tree ring proxies, these three states should therefore provide a better prediction of past US GDP growth than if we were to use data from all 50 states. Clearly there is a cause and effect relationship between the GDP of LA, VA and SC and the US national average. So if climate science is correct, then by eliminating those states that do not track well with current GDP we should get a better prediction of past GDP than if we were to include data from all 50 states. In reality we do not. Just because LA, VA and SC match the current GDP doesn’t mean they will match over the long term. You get a much more accurate long term result by including all 50 states. This is the mathematical fallacy of tree ring science. It is based on faulty mathematics. It sounds logical but it isn’t. Climate science based on selective use of tree ring proxies is no more valid than counting the lumps on someone’s head to predict intelligence. The problem mathematically is that you are comparing the individual to the average, and from that concluding that the individual predicts the average better than the group. It is nonsense. For example. Take a group of 100 people and computer their growth in average income over the past 20 years. Now take the 5 individuals that for the past 2 years best match the average. Tree ring science would have us believe that these 5 individuals provide a better prediction for past incomes than if we took all 100 individuals. After all it is logical. The 5 better match current averages, so they should better match historical averages as well. What this really speaks to is the quality of education, that so many would be duped into believing such an obvious error in logic. The 2003 paper by Professor McKitrick and Steve McIntyre has not been accepted by the scientific community, so you have not “fixed” my statement. The National Center for Atmospheric Research confirmed the principal results of the original hockey stick done by Mann (http://www.cgd.ucar.edu/ccr/ammann/millennium/refs/Wahl_ClimChange2007.pdf). Tree ring data is a great proxy record, when they compare them to instrumental records they correlate almost perfectly as shown in this graph (http://www.skepticalscience.com/images/Divergence_Tree_Growth_Temp.gif) which is from this paper (http://eas8001.eas.gatech.edu/papers/Briffa_et_al_PTRS_98.pdf). Also you don’t reduce the number of tree ring proxy’s you use before 1960’s, you try and increase them, so that you can average out any of the ones that might not be a good proxy record. At the end of the day, Mann took all the criticism and created a temperature reconstruction without tree ring proxy’s (http://www.ncdc.noaa.gov/paleo/pubs/mann2008/mann2008.html). Any competent mathematician that is free to chose which proxies to include and which methodology to employ can create anything they want to show. Any time you allow the researcher any sort of a choice you introduce the unconscious bias of the researcher into the result, which leads to an under-estimate of the error in the results. Thus the need for double-blind controls. Thus the need for archiving and independent confirmation by a hostile researcher. Not only are these not present in much of climate science, as we see from the climategate emails there is an active program to prevent disclose of contrary results and data. The important point is not what you can show with the data, but whether the data can also show a contrary result with a different methodology. If it can, then the result is likely not robust. This is the control that is missing from climate science, which has lead to an explosion of false positives. An overconfidence in the significance of the result. The problem is that other researchers then build on this shaky foundation, and generations of pseudo science results. Billions of dollars that could have been spent productively end up wasted, and the economy goes into the toilet with massive debt the result. China and India boom as consumers pay the cost of moving factories and jobs offshore to save the planet from CO2, while in the end there is no reduction in CO2 whatsoever. All that has happened is that consumers have picked up the tab to move the factories, rather than the manufacturers themselves. The jobs have left, In its place are massive debts owed to China, and the CO2 has returned carried on the wind. Also you don’t reduce the number of tree ring proxy’s you use before 1960′s, you try and increase them, so that you can average out any of the ones that might not be a good proxy record. Deno-thermology continues to remain a pseudo science. The temperature-screening process is statistically invalid. It is cherry picking which falsely increases the confidence interval while reducing the accuracy. It is garbage science based of false logic. If increasing the tree’s before 1960 averages out those that might not be a good proxy record, then the same logic must apply for those trees after 1960. You would want to increase the number of tree ring proxy’s you use after 1960 for the very same reason you use those before 1960, to average out any ones that might not be a good proxy. The simple fact is that there is no valid reason to exclude tree’s post 1960, except that is the exact same time that temperatures started to increase. It is this period, post 1960’s that the IPCC says cannot be explained by anything other than CO2. At the exact point at which there is a problem in explaining the temperature record, this is the exact same point where climate science has cannot explain the divergence problem. Coincidence? Not likely. It simply means that something happened around the 1960’s that climate science hasn’t considered. Also the need not to use data sets upside down. Also the need to admit that it happened once it has been shown that it happened, and to stop citing studies in which it happened. I get a kick out of it when alarmist mutts, like Michael Whittemore, write up what they think is a scathing rebuttal (for the detriment of fresh visitors) and then plug Mann ’08 as their trump card. Cue the “Wheel of Fortune” bankrupt sound. “and that the consensus is what we follow in science. ” — I wish someone would ask Mann exactly how this consensus was achieved so quickly. Einstein had to wait longer to achieve consensus on Special Relativity, which is far less complicated than climate and is still being tested. Okay, Mann, you have consensus. Tell us how it was achieved. I’m thinking it was in some smoke-filled room at the UN and you’re nothing more than a useful idiot. The least you can do is show us the minutes of the alleged “debate” that’s now officially over. Thank you to all who wrote comments above, for the kind words and support. 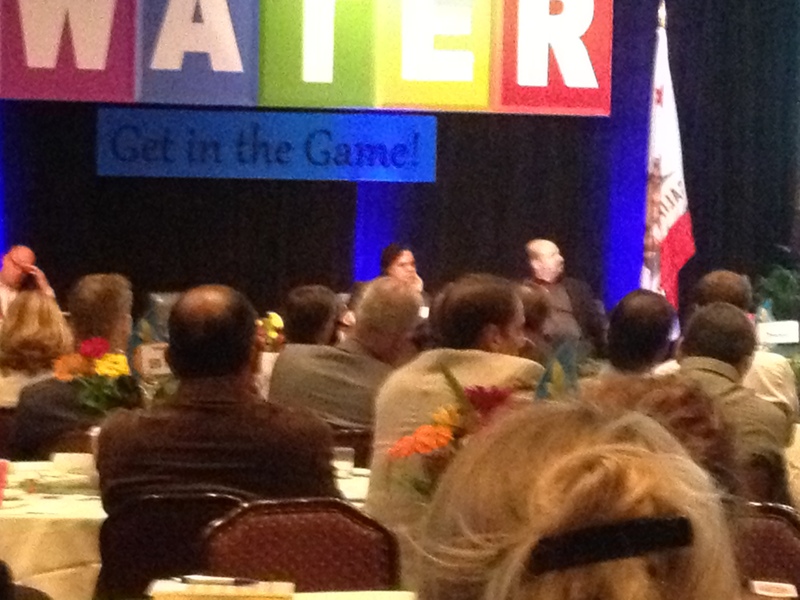 Actually, the Water Summit was quite interesting, and I had fun watching and listening to Dr. Mann. Asking the question was also great fun, and hearing him duck and dodge in his answer. I highly recommend the experience, not only for Dr. Mann, but for any of “The Team” scientists, wherever they speak in public. Any one of us in the “army of independent skeptics” can do this. I just happened to be available that day at Disneyland. “Let the will of the state act, then, instead of that of the individual. Let an institution be created which shall have for its object to keep correct doctrines before the attention of the people, to reiterate them perpetually, and to teach them to the young; having at the same time power to prevent contrary doctrines from being taught, advocated, or expressed. “Let all possible causes of a change of mind be removed from men’s apprehensions. Let them be kept ignorant, lest they should learn of some reason to think otherwise than they do. Let their passions be enlisted, so that they may regard private and unusual opinions with hatred and horror. “Then, let all men who reject the established belief be terrified into silence. Let the people turn out and tar-and-feather such men, or let inquisitions be made into the manner of thinking of suspected persons, and, when they are found guilty of forbidden beliefs, let them be subjected to some signal punishment. “When complete agreement could not otherwise be reached, a general massacre of all who have not thought in a certain way has proved a very effective means of settling opinion in a country. “But, above all, let it be considered that what is more wholesome than any particular belief is integrity of belief, and that to avoid looking into the support of any belief from a fear that it may turn out rotten is quite as immoral as it is disadvantageous. #1 Your so called “scientific community” is anything but. We have seen the trail of emails that show what kind of group of people Global Warming Alarmists really are. “Hide the Decline!” Just Gleick it! Mann hiding his H.S. work. #2 Stating NCAR confirmed the principal results is about as credible as having the IPCC do a movie review on Al Gore’s Inconvenient Truth. #4 But most importantly, Mother Nature has shown Mann’s up schtick to be WRONG! When are the supporters and backers of Mann, Hansen, Gore, Jones, going to get it through their heads the aforementioned lost all credibility when they colluded with each other to cover up scientific results, manipulated data, and hid information that ran counter to their Global Warming Alarm-ism? When are the supporters and backers of AGW going to realize that no papers, even Peered-reviewed papers coming out of the AGW encampment are going to carry any weight, given the past unethical and unscientific behaviors of AGW alarmists? PS: The basis of AGW, that man made CO2 is causing Global Warming is Unscientific, knowing that man made CO2 contributes less than 0.12% as Greenhouse gas. Jeff Alberts says – “Hypocriticalness”?? Really? Out of curiosity, did Zunli Lu actually renounce his findings or was it just Mann? Someone keeps repeating that Mann has made Hockey Sticks without Yamal 06. I don’t know how much these Hockey Stick “reconstructions” are costing the tax payers but I can contruct one real cheap. Just duct tape a yard stick to a boomerang! Darren, it would help to use a smiley or something, so people know when not to take you seriously. “MBH98-99 apparently did substitute instrumental data after 1980 to compute its smoothed version of the HS up to 1980 (“Mike’s Nature Trick”), but in the MBH papers the effect of that was fairly subtle. It was Jones’ later use of the same trick in the WMO graph that gave a completely misleading impression. Really? It was not Mann’s deception but that of Phil Jones at a later date? OK. I will buy that if you explain why it was “Mike’s Nature Trick” and not ‘Phil’s Nature trick’. PS I have tried to use “blockquote” and “bold”. I apologise if this has gone wrong in any way. ….When are the supporters and backers of Mann, Hansen, Gore, Jones, going to get it through their heads the aforementioned lost all credibility…. I really doubt they can continue the Con much longer but the average humans may be gullible enough to allow the scam to continue awhile longer. Is that true? Was Alaska included, or just the continental US?